You'll be greeted by a ConDUCKtors, who'll be narrating your tour. Then you're off on a most excellent journey through the historic sites of Boston, from the State House to Bunker Hill and the Fleet Center, Boston Common and Copley Square to the Big Dig, Government Center to fashionable Newbury Street, Quincy Market to the Prudential Tower, and more. 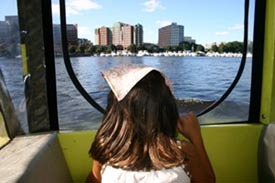 Your ConDUCKtor splashes your DUCK right into the Charles River for a breathtaking view of the Boston and Cambridge skylines, the kind of view you just won't get anywhere else. March 26 - November 26 (All DUCKS are heated.) Tours depart rain or shine, 7 days a week, every half hour from 9 AM to approximately one hour before sunset. Tickets are sold inside the Prudential Center from 8:30 AM - 8 PM (except Sunday 8:30 AM - 6 PM). Some tickets may be purchased up to five days in advance at ticket booths located in the Prudential Center, the Museum of Science, Faneuil Hall and/or over the internet via our website. Please note, if you purchase tickets over the internet, it is not necessary to go to the ticket booth. Go directly to the boarding area. Tickets may not be purchased at the Duck boarding area. If the advanced tickets on the internet are sold out, then the advanced tickets at the ticket booths are also sold out. We do not sell individual tickets over the phone, only for groups of 20 or more. The summer is our peak season, so if you are planning to come during this time, be sure to get here early. We often sell out by noon. **During the week of Veterans Day, any veteran or active duty member of the Armed Forces can take a Duck Tour free of charge.